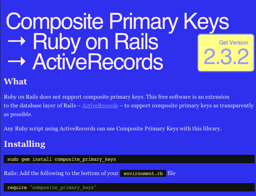 Not so far ago I have found a weird bug in the Open Source Ruby gem called composite_primary_keys, occurred when you specify :primary_key option for has_one or has_many association. There are two ways to get it fixed: submit an issue and wait till someone will work out this problem or fix it by yourself and then pull request to get the patch merged into the core. 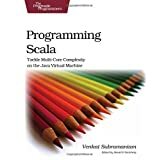 This is a great library and I use it in almost all my project, so I decided to help the author and fix this bug by myself. Here I will show you how to do that. I have discovered, that composite_primary_keys breaks my SQL queries when :primary_key option specified both for has_many and has_one associations. cr.explanation "This document is copyrighted by O'Reilly"
In general to submit a patch to the Open Source project hosted by GitHub you have to perform the following steps: fork the repository on GitHub, write tests which fail, write a patch, ensure it works, push your changes to your fork repository, and submit a pull request. Let’s do just that! If you have any problems, check the test/README_tests.txt file for help. We are doing TDD, right? So before any fixes we have to write a failing test first. Gem we’re hacking has a powerful test suite with many database tables created, so all we need is just to add associations to one of models, which will cover our issue. Well, that are the errors we are working on. Time to fix them! raise AssociationNotSupported, "Polymorphic joins not supported for composite keys"
We are done for now! ~/cpk_bug/composite_primary_keys (master)$ git add . Writing objects: 100% (9/9), 2.14 KiB, done. That’s all, we have contributed to the community! Today Darrin Holst merged my commit into the core, and you can find it here. Not all things went smooth (I forgot to add a fixture, so tests were failing on first run), but he helped me a lot to get it working. That’s how Open Source works: we help each other to develop high quality software. First of all, thanks to Dr Nic for the great plugin, one of the best piece of functionality I can’t imagine life without. Thanks to Darrin Holst for his patience and great help in debugging tests problem, and also for merging my commit into the composite_primary_keys core. Thanks to GitHub for the great Open Source code hosting solution, which makes working on Open Source projects so exciting. Do you have comments or suggestions? You are welcome! Also, I will be happy if you follow me in Twitter. 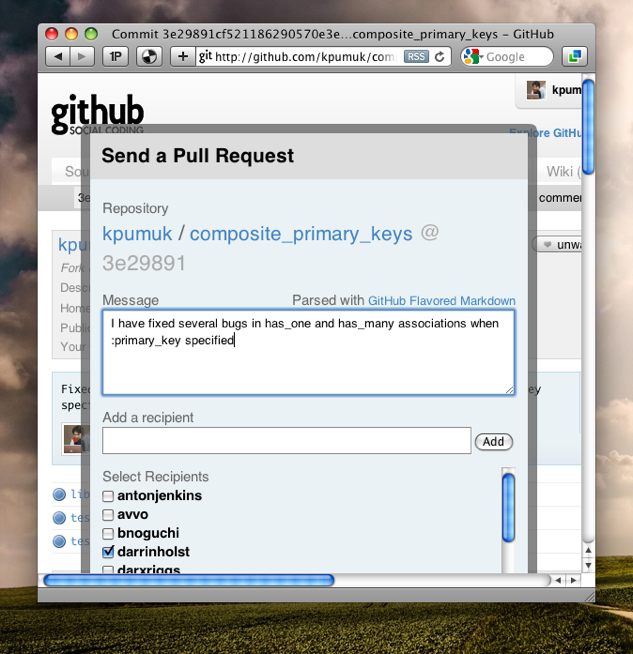 Subscribe to comments with RSS or TrackBack to 'Submitting a patch to the Open Source project: composite_primary_keys'.